Video marketing is one of the effective tools to increase brand awareness and engage the audience. This is an effective tool if done right. There are some common mistakes in video marketing that must be avoided to prevent doing more harm to the brand than anything good. 1. Avoid making a video just to have a video online. 2. Try to figure out for what you are making the video. Define the objective of the video. 3. Not branding correctly is a mistake that should be avoided. Videos are used to promote the business and to communicate with the audience about the benefits of the product. 4. Do not forget to use the brand logo, provide the URL of the website etc. 5. Avoid making the video very long. 6. Create the video engaging in the first ten seconds. 7. Keep the videos short and sweet. Do not exceed ninety seconds, otherwise, it is more likely that people will click away. 8. Try delivering a single and direct message through your video. 9. Do not use a single video to provide information about different things of the brand as this can confuse the audience. 10. Not including a powerful call to action is a common mistake that should be avoided at any cost. 11. Guide the viewers to take some action through a clear call to action. 12. Not using SEO for the video should be avoided. Remember that this helps in driving traffic to the video as well as the site. 13. Properly using the SEO techniques helps in increasing visibility of the videos. 14. It is very rare that videos go viral. Do not expect miracles to happen as well as the views are concerned. 15. Not placing major selling points at the beginning of the video is a big mistake and can lead to dropping in viewer engagement. 16. Not identifying the target audience results in your creation going unnoticed. 17. Create videos only after defining the target audience and focus on the message that needs to be delivered. 18. Do not a hard sell with the video. 19. It is good to build step by step relationship than to directly sell your products. 20. Not making any emotional connection with the audience is a big loss for the brands. 21. A poor title can result in videos not getting many views. 22. Let the title be interesting and catchy to gain the attention of the audience. 23. Having good visual images but not using any voice and text does not make the videos effective. 24. Make sure that the video is delivering the right message to the right people. 25. Focusing on just YouTube should be avoided. There are more powerful social media platforms. 26. Forgetting email marketing is another common mistake that needs to be avoided. 27. Many small businesses create their videos that look like commercials. 28. Businesses should not forget to focus less on selling and more on telling story. 29. Not having a clear branding strategy. 30. Balance the video between being overly promotional and completely lacking the branding. 31. Based on the type of the video decide the length of the videos. 32. Viewers online want entertainment and do not make the mistake of producing the videos without any entertainment value. 33. Not finding out what people want to watch from you should be avoided. 34. If you have lot to say, do it in multiple videos but not in only one video. 35. Not making more videos may result in not able to engage the audience. 36. Creating a video even if the topic is not clearly understood is a mistake. 37. Not having any idea about how the video helps for the business goals. 38. Not having clear idea of where to distribute the video. 39. Not having any idea of how to measure the performance of the video marketing strategy must be avoided. 40. 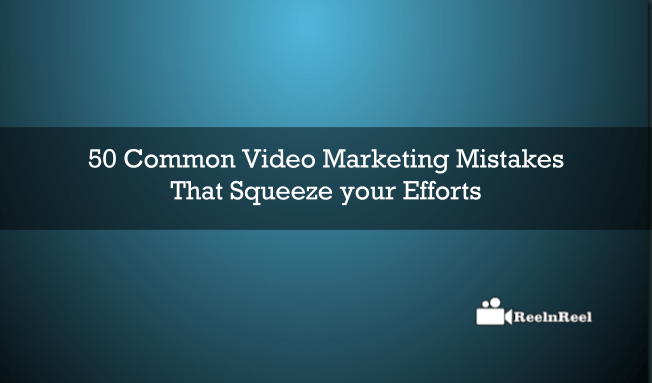 Expecting overnight results is a big mistake in video marketing. 41. Setting unattainable goals for the videos must be avoided. 42. Not using target keywords in titles or description is another common mistake. 43. Not using video hosting platforms like Vimeo is nothing but losing new opportunities. 44. Not creating a perfect landing page to promote the video. 45. Not choosing the right production partners is another big mistake for the brands in video marketing. 46. Using poor thumbnails is another mistake that can be avoided. 47. Do not think that video marketing should be used at the top of the sales funnel. 48. Not focusing on the quality of the videos will affect the views the videos are going to get. 49. Not promoting the video after uploading it should be avoided. 50. Not responding to the comments and questions of the audience also must be avoided. When a video is included in the marketing strategy, it reflects your brand online. Video marketing is the most engaging content type. Avoiding the common mistakes help to connect and engage the target audience and achieve the goal of the video marketing strategy.